If what you don’t flow, might hurt you. Do I really need gutters? Doesn’t the water run off the shingles into the dirt anyways? I am sure we have all pondered this before while cleaning the rotted clumps of leaves out of our gutters, at least once. This seems like a very reasonable question, especially when considering the extra cost of gutters and the seemingly unnecessary service they provide. However, this time of the year may be one of the most critical to have a proper functioning gutter system due to the immense amount of melting ice and snow on your roof! Without proper control of the melt-off from your home, the water would be liable to surround your home in a blanket of ice. Although, many of your children may have recently watched Frozen and enjoy this idea, thick ice is backbreaking to get rid of, and even more dangerous to leave sitting. We often underestimate the effect a slip on the ice can mean for us. Hundreds of people every year suffer injury, and re-aggravate prior injuries, simply by walking to their car in the morning. 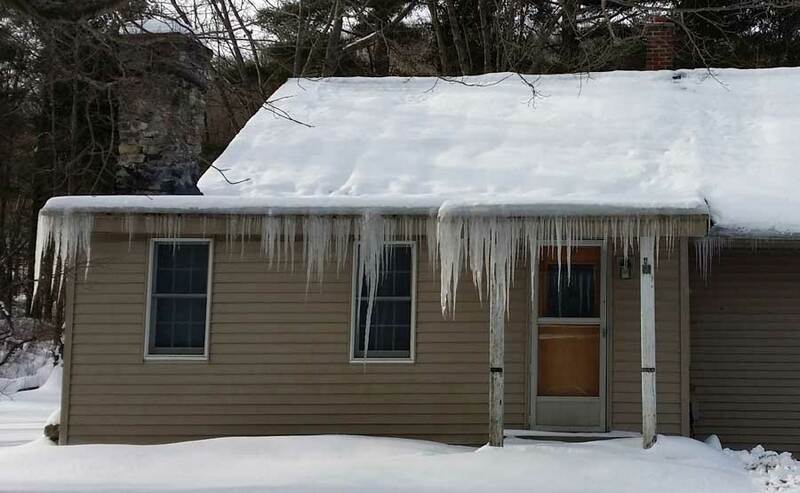 Much of the ice around your home in our Chicago winters in unavoidable, however, large amounts at corners or around downspouts and at the base of massive icicles may mean your gutter system is actually the culprit! If the gutters are leaking, or overflowing due to lack of cleaning, improper pitch, or inadequate size for steepness of roof, you could be setting yourself up for a potential morning of ice skating! We here at Total Roofing do our best to inform our clients, and all homeowners that maintaining an effective roof system, especially the flow of water, ensures a longer life for your house and hopefully, a safer environment altogether! Here’s a short video to those do-it-yourself minded people. Ice, tree limbs, snow, squirrels, bird’s, insect’s, and other debris all have one thing in common: gutter damage. The accumulation of debris (unless you routinely clean your gutters) causes stress which pulls your gutters off the fascia board. Additionally a loose fascia board you may experience premature roof leaking, foundation problems, or even rotting fascia board. The information below may help you fix these problems rather than call a professional, who’ll recommend new ones. Beautiful copper gutters. These are great features on houses, but cautious of thieves. We are not selling you gutters, but we’re selling you the industries way of quick-fix solutions. This can save you money! The first step to updating your current gutter system is thoroughly cleaning them! After cleaning them you’ll identify failing areas. Items needed: Hammer, roof cement, correct galvanized nails (gutter systems vary), gloves, access to water, and patience. After properly setting up your ladder have another person hand you a hose or a bucket of water. You want to hose or empty a bucket of water in two directions: From the roof and directly into the gutter. The two directions provides you a overview of real-life water scenario’s. After identifying the issues you can begin solving the problems. Is the water going away from the house into the gutter? Are the gutter’s guiding the water to the downspout? If the gutter’s hanging loose consider replacing nail heads with new galvanized 5 to 8 inch gutter screws (make you sure you do your research). Please avoid re-nailing the existing nails! The prior nails already are underperforming. Over time nails lose their structural diameter from weather element’s and climate change. Additionally preemptive rust occurs regardless whether their galvanized. After re-anchoring the nails, grab a tube of roofing cement. This work’s well to plug holes and fill bad cuts throughout the gutter system. Holes instantly alter the directional flow of the present system. Gutters are only useful if they direct water away from your foundation, but a hole entirely disrupts the process. You’ll notice these holes after you clean the system. Sometimes a gutter leak occurs where the pieces meet, so investigate all joints. We hope these repair tips help you out! As any of our DIY tasks we recommend only adults do the quick-fix methods due to using a ladder and working with sharp metal. If you have any question give us a call at 708-201-7550. The first step in roof and gutter maintenance is to have the gutters cleaned out. You can do this yourself or hire a professional, but either way make sure this is taken care of late in autumn. Since leaves, acorns, and other detritus can accumulate throughout the fall, you don’t want to take care of this too early and still have problems later on. Hiring a professional will set you back between $75 and $300, depending on the size of your home and the number of stories. The DIY approach is free unless you have to buy the materials required: ladder, bucket or pail, leaf scooper, and broom. The good news is that most people can clean out their gutters in just a few hours one weekend afternoon. Roof and gutter maintenance are always required at inopportune times. Kids are headed back to school, the holidays are fast approaching, and you don’t have time to get up on the roof as often as you’d like. Gutter covers or guards are a convenient solution. Simply put, a gutter cover slows or stops the accumulation of debris in your gutters. They filter the leaves and dirt from the water so you don’t have to clean them out as often. If you plan to do it yourself, set aside an entire weekend for the job. The process is time-consuming, and you might need to take frequent breaks. Again, you can find DIY materials at your local home improvement store. Gutter guards vary in price, but range from $3 to $6 per three-foot length of guard. Wider covers (five inches or so) cost more than narrower options (about three inches). It will be more expensive to hire a contractor, but the guards will be higher quality and will last longer. Tree limbs that seem stable through the summer and fall might not be safe once they are burdened with a few pounds of snow. Winter maintenance requires trimming of all tree branches that could potentially damage the roof. Tree trimming prices vary depending on where you live, the height of the trees, and the complexity of the job. Get quotes from several different contractors, and look for quotes between $200 and $600. The final step in winter maintenance is roof repair. Any leaks, ventilation issues, or insulation deficiencies should be handled prior to the onset of winter. Look for stains on walls, missing roof shingles, and moisture accumulation around gaskets, gutters, downspouts, ridge caps, and dormers. Many contractors offer free inspections for those who are uncertain as to whether or not they have a leak. Remember that roofing contractors are busiest this time of year, though, so make sure to call well in advance. Information was found on Yahoo’s home exterior page.